Cliff Swallows always strike me as the blue-collar members of the swallow clan, if swallows wore collars. What I mean is, they are a hard-working, beak-to-the-grindstone kind of bird. Life isn’t easy for them. [In] spring when they begin nest construction, they gather mud by the tiny beakful, mix it to proper consistency, and carry it back to the [eaves under the University of Washington’s Intramural Athletics Building]. 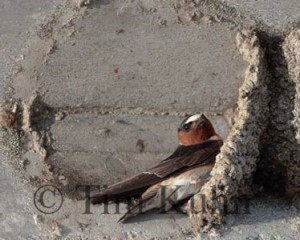 It took hundreds of beakfuls of mud to make a nest, and hundreds of swallows to make the colony. Seeing them toil at the mud bank of the Main Pond, like Israelites making bricks for Pharaoh, or watching them wing back and forth endlessly now in fall, making fat for their trip, I have always assumed that Cliff Swallows do not believe in partying till you drop. So it was with jaw-dropping wonder that I watched a first-year Cliff Swallow break off from his laboring brethren, float up into the ether, and commence executing barrel rolls that would have put the Red Baron to shame. With a casual dip of one wing, he tossed off a roll, flapped a little to gain air speed, tossed off another roll, squeaked to the chain gang below, and then did it all again. There is a time of life when you feel so strong and vital that exuberance fills every cell, and you simply must run, or dance, or do a barrel roll. Has that vitality passed from us baby boomers? Absolutely not! We may have reached the age when we can’t get up or down without making a noise. We may think twice before bending over to pick up something, and then when we’re down there think about what else we can do before we straighten up again. But inside, we are still eighteen. And inside is where it counts. [One] bird who can’t seem to help singing throughout the summer is the little Willow Flycatcher male who set up shop in the dead willow snag on Main Pond this year. 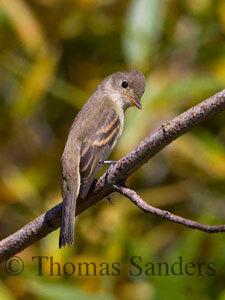 Willow Flycatchers belong to the Empidonax family. There are eleven different species of Empidonax that come to the U.S. from Central and South America to breed every summer. The distinguishing characteristic of Empidonax flycatchers is that there is no distinguishing characteristic. They all look alike: brownish to olive backs, grayish to yellowish fronts, a couple of whitish wingbars, whiskers around the beak. Not a peacocky family. In fact, they’re all LBBs [little brown birds]; or, if you’re from Texas, LBJs (little brown jobs). Oh, you can see minor differences in eye-rings, yellow wash on the belly, bill length and color, tail length, and such. But the truth is, the best way to tell one flycatcher from another is to hear its song. I have to say the Willow’s song is down at the far end of the bell curve of euphony. Many people would scarcely classify it as song at all. More the crankcase than the heavenly trump. But to the singer, his music is sublime. You can see he thinks so because of the way he looks around for a listening female after he finishes one particularly energetic burst. He obviously believes his talent is great enough to bowl over any gal in the vicinity. It’s a lesson for all us seemingly untalented talents. To an outside ear, our song may not qualify us to appear on stage, but it is uniquely ours. No one else can sing it as we do. No one else ever has or ever will. Therefore, sing it loud and sing it proud. Your song is beautiful. It will bring happiness to all those who care about you, just as the Willow Flycatcher’s song brings a smile to all who hear it. 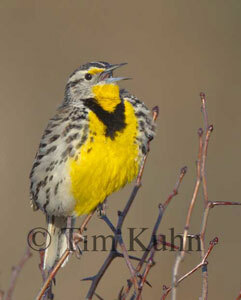 We usually host one or two meadowlarks from November to March, so I was glad to hear one when it arrived this year. He must have been eager to sing, because he wasted little time warming up. He gave a few burbles, shook out his feathers, peeked around the curtain of leaves in the pear tree, and took one last preen. Then he was ready. Ascending to the top of his perch, he began, his song flowing out of his little body, filling the empty blue of the sky. Ah, I said to myself, it’s to be a serenade. Two opening notes, descending, played forte; seven more glissando; a staccato trill; then a long pause. Quietly, so as not to disturb the musician, I did what anyone in the cheap balcony always does after the first movement ends. I crept to a better seat. Setting up my camp stool near the pear tree, I managed to seat myself again without too many glares from the maestro. He did ruffle his feathers a little, and I feared he would stalk offstage in a huff, but then he settled back down and resumed his music. Perhaps he enjoyed the rapturous look on the audience’s face, for eventually he turned to play right at me, [showing off his glowing yellow chest]. For a brief moment — the mere length of one bird’s song — I lived on a planet graced by a binary star: the sun on high, and the meadowlark gleaming as brightly down below. The liquid notes of his serenade trilled through the dust motes puffed here and there by the wind, joining together the tangible and the invisible into one glorious whole that enwrapped every living thing. Including me. The discordant noises of human activity dwindled from my consciousness and were gone. Here, in the orchestra of nature, there is no cacophony. There is only the harmony of birdsong, wind sighing through grass, autumn leaves breaking off from their anchor stems with a little crack and drifting down, wavelets lapping against a log, the lazy hum of insects, a beaver’s slapping tail. It is peaceful, beautiful. And it is ours whenever we choose to listen.